When murderous bands of militiamen begin roaming the western United States and attacking government agencies, it will take a dedicated group of the nation's finest and toughest civilian airmen to put an end to the homegrown insurgency. U.S. Air Force Lieutenant-General Patrick McLanahan vows to take to the skies to join the fight, but when his son, Bradley, also signs up, they find themselves caught in a deadly game against a shadowy opponent. When the stock markets crash and the U.S. economy falls into a crippling recession, everything changes for newly elected president Kenneth Phoenix. Politically exhausted from a bruising and divisive election, Phoenix must order a series of massive tax cuts and wipe out entire cabinet-level departments to reduce government spending. With reductions in education and transportation, an incapacitated National Guard, and the loss of public safety budgets, entire communities of armed citizens band together for survival and mutual protection. Against this dismal backdrop, a SWAT team is ambushed and radioactive materials are stolen by a group calling themselves the Knights of the True Republic. Is the battle against the government about to be taken to a new and deadlier level? In this time of crisis, a citizen organization rises to the task of protecting their fellow countrymen: the Civil Air Patrol (CAP), the U.S. Air Force auxiliary. The Nevada Wing - led by retired Air Force Lieutenant-General Patrick McLanahan, his son, Bradley, and other volunteers - uses their military skills in the sky and on the ground to hunt down violent terrorists. But how will Patrick respond when extremists launch a catastrophic dirty bomb attack in Reno, spreading radiological fallout for miles? And when Bradley is caught in a deadly double-cross that jeopardizes the CAP, Patrick will have to fight to find out where his friends' loyalties lie: Are they with him and the CAP or with the terrorists? 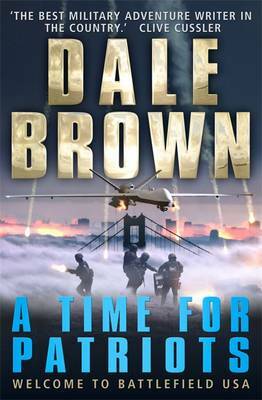 With "A Time for Patriots", the "New York Times" bestselling master of the modern thriller Dale Brown brings the battle home to explore a terrifying possibility-the collapse of the American Republic.